It’s hardly a novelty to observe that the Star Wars prequels (episodes I-III) rewrite the original trilogy (episodes IV-VI). This phenomenon has been noted by much better writers than myself, but it’s worth another look because the whole shape of that original trilogy gets so completely changed when viewed in the new light. But that aspect of the original trilogy’s appeal is rather erased by the new perspective. Now it’s almost as though Luke is the pawn of Obi-Wan and Yoda. He is the superweapon that they craft against the Empire, no less than the Death Star is the superweapon the Empire crafts against the rebels. Obi-Wan now appears like a father who never achieved what we wanted to, but tries to live through his son by (for example) pushing him to play football more than the kid wants to. On the other hand, calling Luke a superweapon may be overstating it a bit, especially compared with the old-time Jedi. The lightsabre duels in the original trilogy are sort of stately and choreographed. You can see and understand what’s happening, and follow the progress of the battle. In The Phantom Menace, the speed and elaborateness were raised in the Darth Maul fight, though I admit to good effect — helped by the clever choice of Wagnerian choral soundtrack music. By Attack of the Clones, they were too fast to follow, and in Revenge of the Sith they are faster still, so we literally can’t see (or, really, care) what’s happening: the result is that the fights — all of them, and there are plenty — end up being reduced to a random whirl of light that continues until someone arbitrarily wins. The relevance of this (it’s not just whining) is that given the heights Jedi duelling has reached by Ep. III, the manoeuvres of Ben and Vader in Ep. IV, and of Luke thereafter, look very lame. This actually makes some sense: Vader is a cripple, Ben is an old man, and Luke is a novice. So it doesn’t offend me dramatically. But it sure doesn’t back up my earlier contention that Luke is any kind of a superweapon. The interesting thing is that Luke succeeds despite his manifest inferiority in Jedi power to the Emperor (and also to Vader, except during that final rage-energised assault — it’s clear that Vader is not really trying most of the time). His final success is in turning Vader, or maybe we should say Anakin, against Palpatine. And the quality that makes him able to do that is of course not any Jedi powers he has acquired, but the simple fact of his being Vader’s son. In a sense, all Luke’s Jedi training is a red herring: what defeats Vader is simply the recognition of his own son — whose presence makes stark the choice between the Dark Side that he has chosen and the other path that he has rejected. Luke’s superweapon in the end is his own vulnerability, and it is only through his utter defeat that he is triumphant. Working out the parallels with the crucifixion is left as an exercise to the reader. The Star Wars films are not explicitly religious, but I don’t think it’s a reach to say that they gain a lot of their gut-level power by analogy with Christian theology. Of course, while Christianity itself is desperately untrendy, Christ imagery is near ubiquitous in movies and TV. It’s almost impossible these days to film a hero falling off a high place without him spreading his arms Christlike as he falls. In the crumbling last days of Russell T. Davies’s regime, it felt like David Tennant was pulling this visual trick several times every episode, so that whatever power the mere visual pun may once have had got diluted down to homeopathic levels. It’s sobering to look back on Star Wars, of all things, and realise that it was pulling a similar trick but with real depth. That’s the thing about Star Wars. The depth is all below the surface. When the original movies are good (which is most of the time), they arrive where they do by touching deep nerves, but not doing so in an obvious way. They look like mere pulp adventure, but they’re not. The more I contemplate them, the more I admire them. And so once more, we come face to face with the central question of the Star Wars hexology: is Lucas a genius who put all those layers in there deliberately? Or is he just monstrously lucky? By the way, I assume the significance of the name Anakin has not escaped you? “Ana” is the Greek prefix for “again”, as in “anastasis” (“again life”) for resurrection, and the so-called “Anabaptist” church, which baptised adults who had already been Christened as children. “Kin” of course means “family”. So Anakin is one who one again becomes family. Having explicitly abdicated his role within the family of the Jedi, and even repudiated his love for Padme and, by implication, for his unborn child(ren), he finally returns to become both reunited with his son and, again, part of the Jedi family. Can that be accidental? If so, if “Anakin” is just a nonsense name like “Boba Fett”, then it is the most absurd piece of good luck of Lucas’s part. This entry was posted in Movies, Reviews, Star Wars. Bookmark the permalink. Why? What’s its relevance to this post? 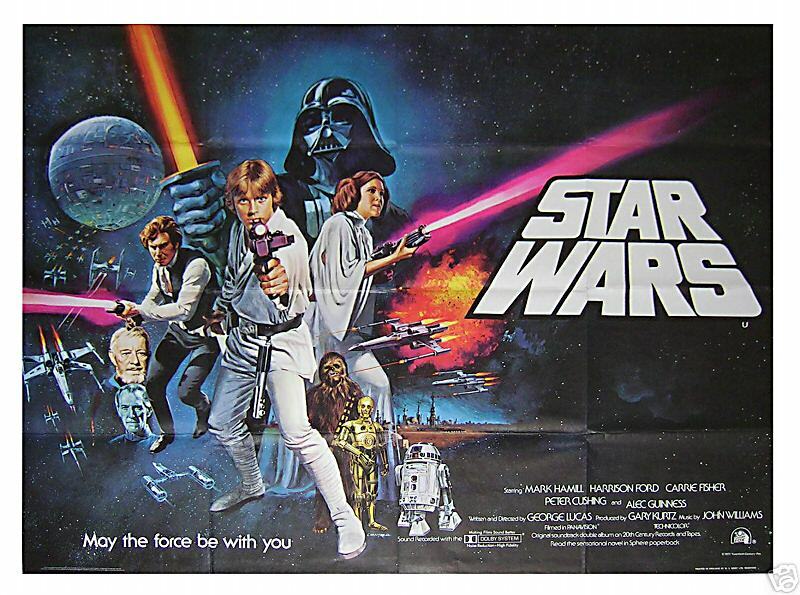 I always, even as a kid, assumed “A New Hope” referred to Luke himself, even having only seen the first one. On the loss of the chance adventures of Luke: well, as you are of course aware, and Dirk Gently would say, everything is connected, and very very little is truly random. I recall a lot of the same sentiment about the new Star Trek movie: “How convenient that they all served together on that first mission, that Kirk ran into Scotty on Delta Vega, etc, etc,” that it was a cheap writing trick to line everything up to come out the way we know it to be. Well, it all had to come about somehow! Knowing the events (the prequels) that lead to the circumstances of Luke’s placement on Tatooine, his tutelage by Obi-Wan, and his eventual role in the the fall of the Empire doesn’t diminish my ability to experience the originals through Luke’s eyes. As in Greek drama, the interest has shifted from learning each new twist of information, but in seeing how the characters react. You didn’t do this (i.e. complain that the “father” reveal in ESB is now lost due to the prequels), but if this were the only dramatic value in a narrative, why would anybody see a remake of a film they’ve already seen, or an adaptation of a work they’ve already read? Many people indict the prequels for “ruining” the original trilogy for them, but if they opened their minds a little, they might find, whether they care for the films themselves or not, that the prequels actually delivered new ways to watch the originals, and gave them new depth. I might well review A Christmas Carol, yes (the 2010 Doctor Who Christmas special). But don’t take that as a binding commitment. Wanted — not an epic movie by any stretch; although decent enough action flick. But touches on one of the themes you discussed here. Oh, and ‘Anakin’. Staying entirely within Greek theme, rather than merging language families, Vader’s given name could reasonably mean ‘moving again’, or ‘active again’, i.e. ‘re-energised’. Given the close relationship between the Greek prefix ‘kine’ and the notion of ‘Force’, and Vader’s ultimate redemption from the Dark side, this seems to me a more probable explanation for his name. Mike: True enough. The perception of Luke’s character does change with the prequels, though I maintain it’s possible to step back and still experience it from his angle, as ANH is largely told through his eyes. Vis Star Trek, I may have been conflating your comments with others I have read/heard, complaining about the “inbred” nature of the expanded Star Wars universe: of course they would make R2 belong to Padme, and 3P0 be built by Anakin; put Boba Fett’s father as the main bounty hunter in AotC; put Chewie in the Wookie battle in RotS, etc. Characters that appeared to come together by chance in the original trilogy were really already connected before hand, and that doesn’t sit well with some. Me, I think it’s all a great story, and you can enjoy it on the action-packed surface of it all, or the motivational and metaphysical layers underneath. To complain about the recurring characters and themes is to complain about the very matinee serial genre Star Wars comes from. Perhaps we’ve been a bit hard on George, anti-bedazzled by the fact that he can neither direct nor write good lines on his own. But we know he knows about the Cambellian Myth theory and writes to that. While I don’t believe this was the plan at the time of the filming of A New Hope, it is plausible this was the intention at the time of the prequels. I suppose that makes a great hexology, but I still wish he’d brought in help for the directing and the microstructure of the scripts. There are a couple of points where the prequels really change the view of the original trilogy. One of the biggest is the scene at Ben’s place on Tattoine. Now, I sit through that scene thinking, Luke, you don’t know the half of it. I mean the scene changes scope after viewing Empire, but after viewing the prequels, the entire backstory runs through your mind and Ben’s just lying like a dog. Also, one of the really interesting things about watching the originals after the prequels is paying attention to R2-D2. If you watch at the end of Sith, only 3P0’s memory is erased. R2 gets to keep his knowledge of everything. This makes some scenes of the original 3 movies really interesting. The scenes when they meet Ben in ANH take on a whole new meaning. R2 sets out to find Ben due to that “strange devotion in a droid” purely because he knows who Ben is and quite possibly could know where he lives, or at least what direction to set out in. Notice Ben says he doesn’t remember “owning” a droid, well he didn’t own R2, but he knows who R2 is (in my opinion on re watching R2 is visibly annoyed at this :-). Also of note is that in Bespin R2 NEVER runs across Vaders path. Of course the big question is then about why he doesn’t warn Luke about Vader. The answer IMHO is that its because he IN on it. He knows who Luke is, he knows he’s “the New Hope” and he goes along. R2 is an agent of the old republic just like Ben and Yoda. In fact, that totally changes the scenes with Yoda on Dagobah, because then R2’s just messing with him for fun. It also explains R2’s attempts to snoop because he doesn’t want to miss out on Luke’s first conversation with Yoda at his hut. Because he KNOWS. I think the view of R2 is the coolest change to the original trilogy after watching the prequels. Jason: Wow, perhaps it’s just so “organic” of me, but I never gave the changes to R2-D2’s character much thought, apart from Ben’s “owning a droid” line. Cool! What I want to know is, does Vader realize it’s R2 he’s blowing up in the trench? “I have you now!” He must not, because surely it would pique his curiosity to find his old, faithful droid companion on board this X-Wing. I suppose that after 20 years, and himself being largely a droid now, they must all fall into that “dime a dozen” category, like toasters as George has said. Plus, Vader may feel a certain contempt for droids, given all of his experiences and his own wrecked body. Yeah, my take on Vader blowing up R2 in Star Wars would be that the droid would be really hard to identify in the X-wing. Yes! Thanks, I have been meaning to bookmark that but couldn’t remember the name or place. Hmmm, now that you guys mention it, Lucas has said a few times on the DVDs that R2 is the hero of the movie. I thought he was just saying that he needs at least an action sequence per movie, because he is cute and loveable and everybody wants to see such a small, apparently defenseless droid overcome big threats. But then again, maybe Lucas was being more literal. Heh. I’m going to throw a question and a comment out there, and please correct me if I am wrong in what I remember. My memory is often like a sieve. Anakin was trained as a Jedi to bring balance to the force, correct? That was the prophecy of the Jedi or some-such, if I recall correctly… If I understand the history of the movies correctly, the Sith had been banished and almost completely overrun by the Jedi in the Episode 1. 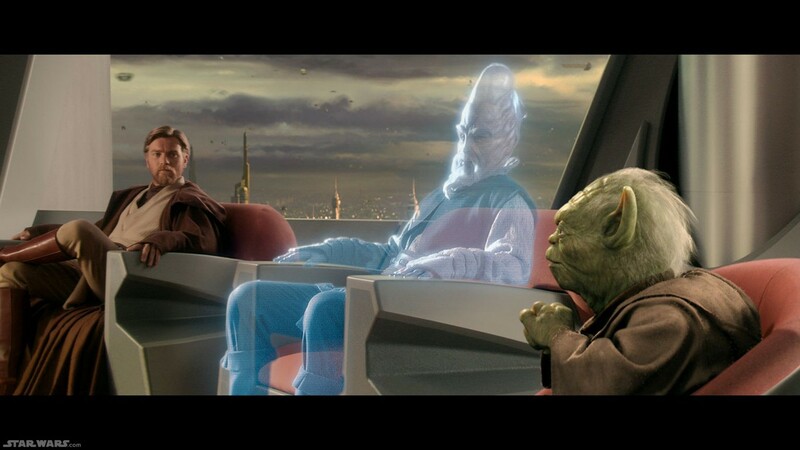 So it seems to me that the Jedi misread the prophecy and that Anakin brought balance to the force by bringing a great force of evil into what was a situation where the Good guys dominated entirely. Balance, but not the way they thought it would be. I also don’t think that Luke was the “new hope”, it seems to me that the new hope was the fact that they blew the Death Star to smithereens, thereby winning a victory in what had become a 20+ year war for freedom from the evil empire. I don’t believe for an instant that Luke was crafted to be some sort of superweapon of the Jedi. As for R2-D2 being the true hero, well, that will take further contemplation, and, perhaps a marathon viewing of all of the movies…. in the order they were released.